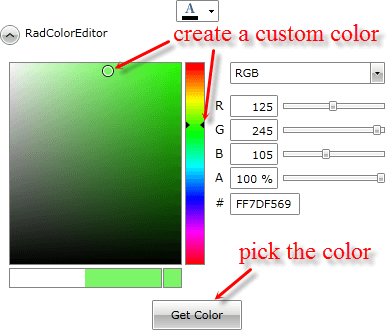 This article will show you how to use the IsRecentColorsActive property of the RadColorPicker control. 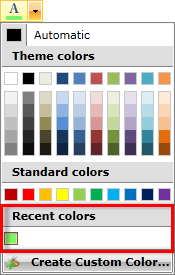 The RecentColors palette is visible when the IsRecentColorsActive property of the RadColorPicker control is set to True and the selected color does not exist in MainPalette, HeaderPalette or StandartPalette. Finally in the confirmation's button Click event handler we implement the selection logic of the customized color. 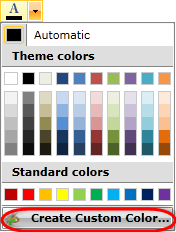 Click the "Create Custom Color" button. Create a customized color using the thumbs and pick it. 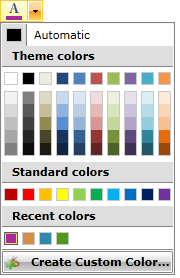 Your custom color will be added to the RecentColors palette.